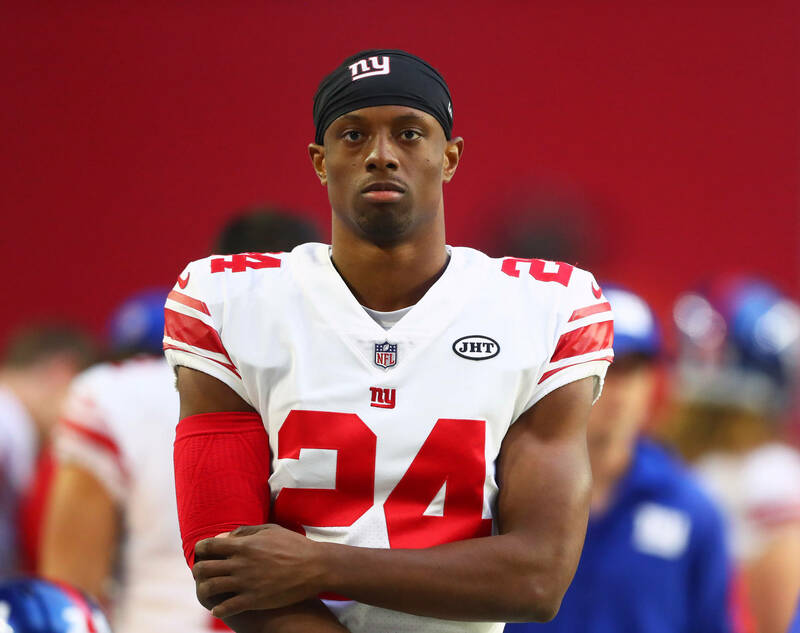 Eli Apple Mom, Family, Height, Weight, Measurements, Is He Gay? Home Sports Eli Apple Mom, Family, Height, Weight, Measurements, Is He Gay? Eli Apple is a young and talented football cornerback who plays professionally for the New York Giants of the National Football League (NFL). Drafted by the Giant during the NFL Draft in 2016, Apple was the 10th overall pick in the first round of the draft. He completed his collegiate career with the Ohio State Buckeyes football team. During his college career, Apple won the 2016 Fiesta Bowl Championship and 2015 CFP National Championship. In addition, he led the Buckeyes to win the 2015 Sugar Bowl Champion and the Big Ten Championship in 2014. Following his outstanding performance, Apple was named the Defensive MVP of the Fiesta Bowl in 2016. Learn more about his bio, mom, and measurements below. Also, find out if he is gay. Born Eli Woodward to his mother Annie Apple on August 9, 1995; he was raised by his mother and stepfather, Tim Apple whom he officially adopted his last name in 2012. There is no information regarding his biological father. Apple was born in Philadelphia and he grew up in Voorhees, New Jersey along with his three step-siblings. He started playing football at the age of eleven and he completed his high school career at Eastern Regional High School in New Jersey. Upon graduation, Apple got over twenty college scholarship offers from top Universities in America. He went on to accept offers from Ohio State University where he completed his college football career. Apple was redshirted during his freshman year in 2013 and the following year, he was on top form for the Buckeyes leading them to clinch victory at the Big Ten Championship. He led the Buckeyes to victory at the 2015 Fiesta Bowl, Sugar Bowl, and College Football Playoff. He won the 2015 Fiesta Bowl Defensive MVP Award. After an impressive junior year, Apple decided to forgo his senior year to join the NFL draft of 2016. Eli Apple participated in the 2016 NFL Combine ranking No 10 in the 40-Yard dash with a finishing time of 4.40 seconds. During the 2016 NFL Draft, Apple was picked by the New York Giants in the first round of the draft. He penned down a four-year contract worth $15.15 million which include a signing bonus of $9.21 million. Joining the Giants, he was placed as the third cornerback behind Dominique Rodger-Cromartie and Janoris Jenkins. Apple ended his rookie year with a total of 14 games, 7 pass deflections, and 51 combined tackles. He started the 2017 season as an outside cornerback alongside Jenkins; towards the end of the season, Apple was suspended by the team due to attitudinal issues. Eli Apple was born to an African-American mother Annie Apple; he is the third out of her four children. Apple was raised by his Annie and stepfather Tim Apple, he has a nephew Michael Blackson. It hasn’t been all rosy for his family who has been in a series of issues. His stepdad has been by his side since he started playing college football. While the rift between Tim and Anne continued to erupt, the pair decided to go their separate ways in May 2016. His mom was born in West Africa and she moved to the United States when she was eight. She grew up in Southwest Philadelphia where she completed her basic education. She graduated from LaSalle University in Philadelphia where she was the president of the National Honor Society. Annie graduated with a bachelor’s degree in communication and English; she has also worked for various establishments as well as media agencies. She has worked as a Public Relations consultant and freelance Digital Content Developer. In addition, she has worked as a contributor to notable media networks including NBC, CNN, and CBS affiliates in Philadelphia. She has equally appeared on Philly’s 101 Show. However, she came into the limelight in 2016 following Eli’s inclusion in the NFL draft. The same year, she joined ESPN where she worked as a contributor on the show titled NFL Countdown. She also appeared on His & Hers alongside Jemele Hill and Michael Smith. Asides her appearance on TV shows, Annie also runs her own blog Survivin America which she founded in 2011. The blog focuses on Pop Culture, Lifestyle, Inspiration, Love, and Sports, among others. While gay players have not fully accepted in the National Football League, there have been several players who have been involved in several rumors with regards to their sexuality and Eli Apple happens to be one of them. During an interview between Eli and the Atlanta Falcons at the 2016 scouting combine program, one of the Falcons coaches popped the question – So do you like men? Apple quickly gave out his answer as ‘No’ but the question raised several eyebrows which the Atlanta Falcons later released an official statement to apologize for such an act. Recall that the whole media went abuzz when Michael Sam disclosed his sexuality as gay prior to the 2014 scouting combine. While he is the first NFL player to come out openly as gay, he certainly won’t be the last of them. It is an already known fact that the NFL condemns sexual discrimination among coaches and players; nevertheless, they rely on player abilities and what they can bring to the field rather than their sexuality. Apple is so talented when it comes to manning the cornerback for the Giants, thanks to his wonderful physique and well-built body structure. He has optimal speed, good height, and arm length which contributes to his great balling abilities. He stands at a height of 6 feet 1 inch with a commensurate weight of 199 pounds. Apple has been doing a lot of work at the gym over the past few years and has greatly improved on his technicalities. With an arm length of 313/8 inches and hand size of 93/8 inches, be sure you’ve got a player with potentials to rise to superstardom in the near future.